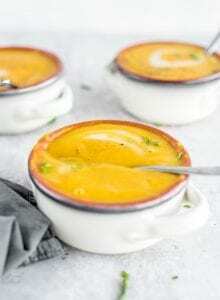 This wonderful squash soup is so easy to make in your crockpot. Just throw all the ingredients in, let it simmer away, blend it up and enjoy. I kept it simple but a chopped apple and some coconut milk also make yummy additions. Add all the ingredients to a slow cooker and cook on high for 4 hours or low for 6-8 hours until the squash is soft and tender. Once it’s cooked, either blend directly in the slow cooker using an immersion blender or carefully pour into a blender and mix until smooth and creamy. Blend in the coconut milk now, if using. Leftovers can be stored in the fridge for up to 5 days or freezer for up to 3 months. You may need more or less liquid than specified. Use enough to just cover the veggies in the slow cooker then you can thin it out a bit after blending if needed.